In today’s practice of retail religion, we pursue faith has a consumer and miss the purpose of church. We’re quick to change churches over the smallest of issues. Yet, usually the best action to take is no action: Don’t change churches. Often we should stay where we are and not go church shopping. Yes, there’s a right time and a wrong time to change churches. We need to discern between the two and act accordingly. Here are some reasons not to change churches. Did your church do something to hurt you? Are you angry over something that someone did or said? Though the impulse to change churches is understandable, this is the wrong time to do it. Don’t leave mad because you’ll hurt others in the process. And don’t leave hurt, because you’ll carry baggage to your new church. Instead, seek reconciliation with your church and its people. Then you can switch with a clear conscience, but if you patch things up, why not stick around? It sounds spiritual to say you’re switching churches because you’re “just not being fed.” This sounds virtuous, but it’s really a sign of laziness. It’s not church’s job to feed us spiritually. This is the wrong expectation. Yes, church aids in spiritual growth, but they shouldn’t be the primary provider of our faith nourishment. Spiritual growth is our responsibility. We need to feed ourselves and not expect a minister to do our job for us. Changing churches so we can be fed only masks the real problem. In today’s culture, too many people view church participation as a transaction. They put in their time expecting something in return. They donate their money and look for a return on their investment. This, however, reduces church to a commodity that we shop for. This is the epitome of retail religion, and it misses the point. The truth is, we only get out of church what we put into it. So, if you’re not getting anything out of church, the problem falls on you and not church. Another spiritually-sounding complaint about church is heresy. Yet disagreement over theology is why we have 43,000 denominations in our world today and not the one, unified church that Jesus prayed for. When we charge our minister with heresy, the implication is that we know what is correct and they don’t. We need to embrace the possibility that we might be wrong. Instead, we squabble over things that don’t matter and leave the church. What does matter? Jesus. Everything else is secondary. We need to acknowledge that we can have differences of opinion over matters of faith and still get along. Another side effect of retail religion is changing churches because we don’t like the worship service or the sermon. Again, this is consumerism infiltrating church. All music can praise and worship God. Just because we don’t like the tone or tempo—or volume—it isn’t worth changing churches. Instead, seek to worship God regardless of the musical style or the performers’ ability. Remember, we’re not there as consumers seeking entertainment; we’re there as followers of Jesus to worship God in spirit and truth (John 4:24). The same applies to the message. Yes, some speakers are gifted, and others aren’t; some presenters are entertaining, and others are boring. But every message has something we can learn from it, if we’re willing to listen and look for it. There are many reasons to change churches, but most of these are selfish, shortsighted, and reflect a consumer mindset. This displeases God and serves to divide his church. If you don’t like your church, the better approach is to stick around and be a catalyst for change. Seek to make the church where you’re at become a better one and don’t take your problems someplace else. Our church, and pastor, just went through a very rough season. I didn’t understand what all was going on, and I wanted Father God to “be understanding”, “pet me”, and let me go elsewhere. HE … would … Not! I have been on this walk with Jesus for decades! Way too long for me to be so childish. GOD wanted me to pray and be part of the answer! Not part of the problem! Our church and pastor are doing so much better now. Diana, I commend you for not taking the easy way out. 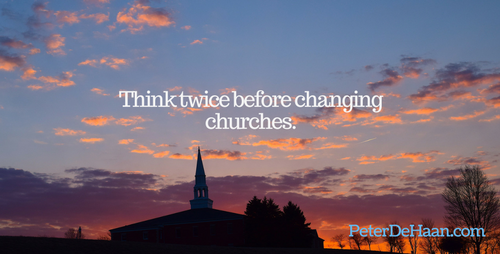 By not changing churches, you honored God and your church family. May you be blessed as a result.